As many of you know Andrew and I have just come out of a so called "in-between" time. Andrew's internship ended in May and we did not start our new jobs until this month. By the world's standards not ideal right? But really, God's timing is so much better than ours, because we ended up with a lot of sweet family time. It was a wonderful season despite the lack of money! But how do you make it with out months of pay? That is a good question. I don't claim that we did these all perfectly, because we didn't... but I do have a few tips. Trust God to provide. There were a number of checks we did not expect to get and things that we thought we would have to pay for and didn't. And even when things did not seem ideal, God made a way. Establish Good Spending Habits. If you learn to budget on a regular basis, it will be easier when you "have to." Plus it is being a good steward when you choose to budget. Establish an Emergency Fund Most people recommend having 3-6 months worth of living expenses saved up for such a time as this. Go Reusable When You Can We did not have to buy a diaper, paper towel, paper napkin or zip lock baggie during the in-between. We had reusable versions of all of these things saving us a lot of spending (especially those cloth diapers)! Spend the Minimum You may not follow your normal budget. You cut things like eating out and clothing. Forge an Income… Even if it is Small Look around your house. Is there anything you could sell on Facebook garage sale pages or eBay? Could you have a garage sale? Most of us have way more stuff than we think and need. You would be surprised what you can make selling your own unused stuff! Accept Help This is big. I think sometimes we think we have to be an island. Especially with in our families and the Christian community, we were meant to help each other. Don't be too prideful to accept help. Make Sacrifices and Smart Decisions Most times there are ways to make sacrifices and save money. When we moved we could have gone straight to an apartment. But we knew the smartest decision was to live with Andrew's parents for a little bit. Continue to Budget and Spend Wisely There is the temptation to go a little crazy with spending again once you have an income. Try to continue to budget and be good steward of what God has given you! Rebuild Your Emergency Fund Chances are you will have depleted this quite a bit. Take the time to bring it back, you never know when another "in-between" will come. Give to Others in Need Become more observant. Are there people around you family, friends, that are in need? Give:). What about you? 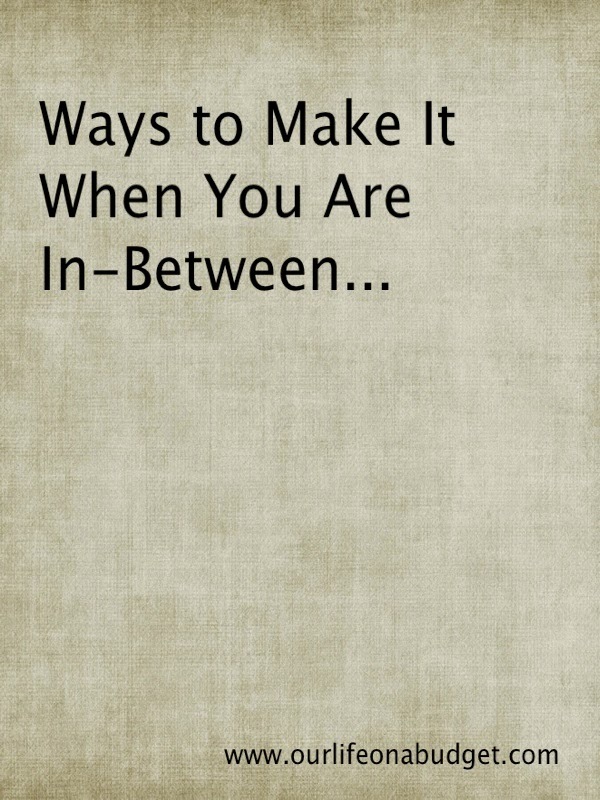 Have you ever been in an in-between? What suggestions do you have? We are currently in the "in-between"…going from two incomes to one and a half. So I know exactly what you are talking about! The hardest one of your tips (for me at least!) accepting help. I'm forcing myself to get better at this. Nice to meet you, Stasia. Your family is adorable. Clicked over from the MADM link-up. I would love to farm or at least garden when we have a yard someday. I love the idea of browning our own food! Lovely post, Stasia!! Leaning on the Father for guidance, strength, and grace for sure....living in limbo is tough. So glad He will never leave us or forsake us!!! BTW I am slow to replying to comments these days. Any questions you ever have about homeschooling just shoot them my way! I am always willing and eager to share. Mentioned above, I too struggle with the asking for help. It's too bad that in this day and age, we feel like we need to keep up with the Jones! And if we're not keeping up with them, then we want to LOOK like we are! Great post - thanks for the tips. Blessings! You are right, that is something we need to keep in check- often the things we think are needs are not! Such good advice! We are in that stage right now and you tips helped me sort a few things out in my own head! Visiting from Counting My Blessings. Great tips. We went from two incomes down to one about a year ago. It was (and sometimes continues to be) a challenge. God is faithful though and I do enjoy the creative ways He does so. Nice to meet you here! One of the things that I have realized too through this time is that in a way we are always really in between. We are in a temporary state on this earth! Really good tips here Stasia. Planning ahead and doing your best to avoid unnecessary debt is so important. Rev and I spent years writing down every purchase, so we'd be able to tell where we could cut if needed. I have to admit I didn't love it, but it was extremely helpful for budgeting. Thanks for linking this at CMB. That is key- avoiding that debt and looking for places to cut. I think when we realize that we are to be faithful with all of our money it helps too! Great tips, Stasia! God is always faithful.